Absolutely lovely, quiet but fast-paced fantasy F/F YA. The story revolves around Aleana, a duchess destined to be queen; Ori, her loyal and hardheaded guard who protects Aleana after an attack on her convoy; and Kahira, a foreign woman marked as a criminal.I'm really disappointed in myself for not reading this sooner - I read the first 2/3 in one sitting, I was so consumed by the details, the action, the characters. The ending happens rather suddenly, but it's satisfactory. Definitely enough to make me want to read the next book! The ending was abrupt, looking forward to seeing what comes next. This is officially the earliest I've dropped a book, at 6% progress. Mostly due to personal taste in writing, but it just all stacked up for an unbearable experience.The first strike was that it's written in first person. That doesn't automatically mean a book is gonna be bad, but it needs some pretty good writing to make up for it, which this book doesn't have.The typical writing rule of "show, don't tell" is immediately thrown out the window when the narrator details her entire life in the first chapter. To make this worse, all of these fantasy-sounding names are thrown at you so quickly that it's near impossible to remember what's what, and the author's demonstrated fear of paragraph breaks is the nail in the coffin. Walls of text just aren't good for getting a story across. 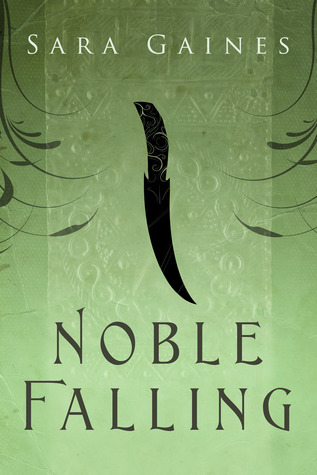 I won Noble Falling as part of a competition run by FYeahQueerTeenLit, and I read it all in one sitting – it made my five-hour train journey whoosh by! The short chapters make it pacy and the story is compelling and fast-moving. It’s even perhaps a little shorter than it needs to be – I would have liked a bit more time to get to know the characters, and a little more depth of characterisation. Having said that, the main character was interesting and sympathetic, and I loved the central relationship between Aleana and the mysterious Kahira! Plus the ending begs for a sequel. What stood out for me with this book is how uniquely small-scale and intimate the author makes the action feel. There are hints of war, and yet the reader only ever sees hints of that through the three main characters. Throughout the course of the novel, they rarely interact with anyone named and this gives the book a very unique feel. Two main characters are queer, but slight warning for one having a tragic queer backstory. Note that every character has a tragic backstory so it doesn't come across as specifically problematic, but it's worth mentioning.